Tinkerbelle came to us with her siblings when her owner could no longer look after her. She is a little timid but has a very sweet nature and does love to be stroked once she knows she is safe. 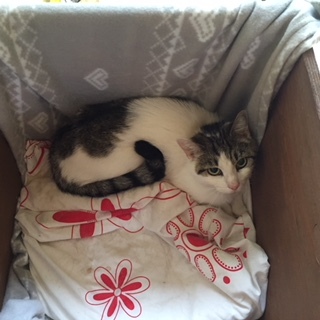 Although Tinkerbelle has lived with other cats, dogs and children, she had shown signs of stress in that environment so we are looking for a calm new home for her. She has been spayed, microchipped, vaccinated, vet checked, and given flea and worm treatment ready for her new home.